A few of our favorite balls were made of plastic, rubber, and bubbles. I used this unit to increase our gross motor skills with a balance activity. Each child had to balance a plastic ball on a wand. Balance and coordination activities help each child to develop self-regulation for daily tasks. Attention and concentration were maintained for a specific task during this game. Easter comes in the spring and we learned about the true meaning of Easter. I used Resurrection Eggs to help the children understand why we celebrate this special holiday. Each child opened a egg as I told the story of Easter. As we celebrate the joys of spring we also had a special friend drop by. The Easter Bunny hopped right in our classroom! 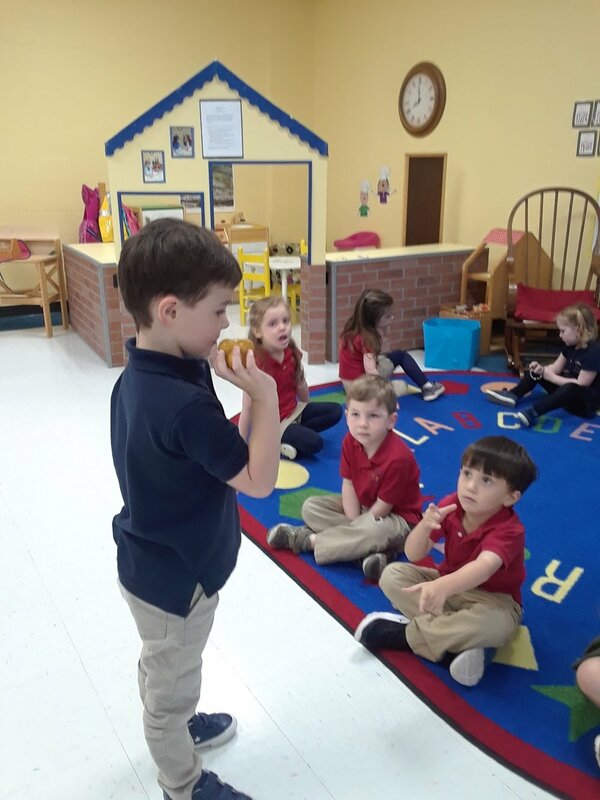 Eggs are a symbol of new life and our classroom was the place to be! Have a great Easter and join us next time as we move on to the recycling unit. With the leftover rocks from a science project, students drew and painted the Easter Story! Each day after our devotion this week, a stone was painted as a reflection. They have these along with a story that they can share with others! We finished our 3rd novel study!! Surprisingly, Pippi won the majority of our hearts! I mean, really what's not the love about her?! St. James Day School students, along with our fabulous Music teacher, Mrs. Tipton, and many other helpers, brought the adorable story to life onstage. This was such an exciting event and we all are eager to hear of next years’ plans!! As students prepare for their Public History & Arts Tours, they gave a tour of our school, St. James! This gave them an opportunity to speak about a familiar setting while adding presentation tactics, skills, and tips learned during our research meetings. During a debrief session, students were able to ask any questions they had about being a tour guide, and the adults gave positive feedback to each student. Thank you, ladies of TRAHC, for taking your personal time and visiting our school! Below is a promotional advertisement that Dr. Black created for our upcoming Community Public Tours Project. Please join us and spread to word! What an amazing day it was celebrating our Grandparents! Following Chapel, each grade performed and demonstrated something they have learned within the school year. 3rd grade presented the “Indian Chant” with recorders. So impressive! Our music teacher, Mrs. Tipton, dedicates many before and after school hours to her students. She is nothing short of amazing and we are thankful for her ability to instill a love for music in each student here at St. James Day School!